Lowdown: In order to save its futuristic earth, the Enterprise's crew needs to save the 20th century whales. 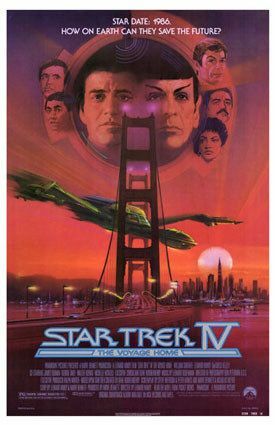 Straight off 1985's Star Trek 3: The Search for Spock comes 1986's Star Trek IV: The Voyage Home. Not only is The Voyage Home a quick successor, it takes off exactly where its predecessor left us. The Enterprise has been destroyed, and its core crew is now flying the Klingon ship the previous movie's baddies came in with. But as our heroes fly back to earth to face the consequences of their actions, something new appears in earth's orbit: an unknown object that seems to be sending signals down to earth, signals no one knows how to answer. In the mean time, this object is wrecking havoc on earth. Lucky for us earthlings, we have Kirk, Spock & Co to rely on. They figure out this mysterious object is calling upon the earth's whales. However, since in Kirk's time there are no whales left, the object will not receive the answer it is expecting to get; it is therefore expected this ancient object will stay there to ruin the earth with its unanswered messaging. What can be done about it? Again, Kirk & Co come to the rescue. They quickly cook up a course to 20th century earth (failing, in the process, to explain why time travel isn't further exploited in Star Fleet's escapades if it happens to be as trivial an affair as the case seems to be here). Once at the 20th century, they land at San Francisco, where they spend the duration of the film trying to put their hands on whales they can take back with them to their future so as they could answer the mysterious object's call and thus have the object leave the earth alone. Whichever way you want to look at it, the whole setup of The Voyage Home is there to serve one cause. It's there to allow the crew of the Enterprise to mess about in the world that the movie was produced at, eighties' USA. While there, us viewers are exposed to the culture of the time, often with a wink. For example, we have the Russian accented Chekov wandering about San Francisco asking for the location of nuclear power plants. As far as The Voyage Home's intended message is concerned, there is a whole romantic story between Kirk and the 20th century woman looking after two whales, the two the Enterprise's crew put their eye on for some time travel. The key message to us is that by mistreating the animals of the earth at our time, we are risking cataclysmic results in the future. I do not know why the script writers had to go as far as a mysterious ancient cone travelling to the earth to seek out whales, but it probably seemed like an exotic notion at the time. Best scene: Scottie trying to talk to a first generation Mac the way he talks to the Enterprise's computer. Having that Mac in this film feels like a major archeological find from three decades ago. Look, The Voyage Home is a pretty lousy film as far as the advancement of the art of moviemaking is concerned. It is certainly dated, too, particularly in the special effects department. As far as fun is concerned? It's damn good, with all its period jokes and attitudes. It's a page of our history books, and an often funny one at that. I liked it 3.5 out of 5 crabs much.